Let's face it. The process of digitizing photos is mind-numbingly slow: the laying of each photo on the scanner and waiting the agonizing minutes for each to be scanned, then saving each photo. And many of these photos are likely faded or discolored so you'll want to do at least some minimal enhancements. Facing this tiresome time-consuming task keeps those old photos stuck in their drawers and shoeboxes. But not anymore. Epson's new (and aptly-named) FastFoto FF-680W ($599.99 on Epson, check price on Amazon) is so fast and easy, it makes digitizing photos fun. You simply place up to three dozen 3.5x5, 4x6 or 5x7 prints into the top of the scanner and, literally a minute later, all are fed-through, scanned, enhanced, file-named and safely stored in a file folder of your choosing on your computer's hard drive, or even upload to your Dropbox or Google Drive account. I am not exaggerating about the entire three-dozen photo scanning process taking only a minute. Check out the video below, which depicts the scanning, saving, enhancing and storing of three dozen 5x7 photos in less than a minute. 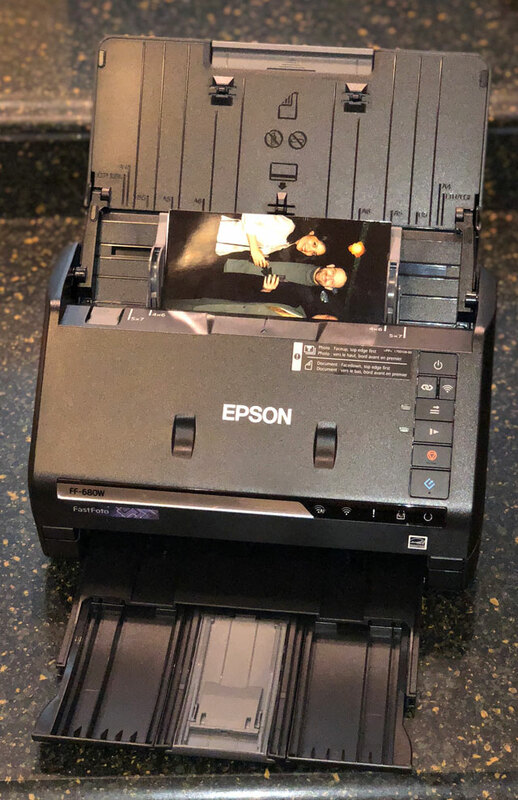 Bottom line: the Epson FastFoto FF-680W is so fast and easy to use, you'll actually enjoy scanning all your old photos to share with family and friends and store safely so that disaster, natural or otherwise, can't permanently destroy the memories they hold. 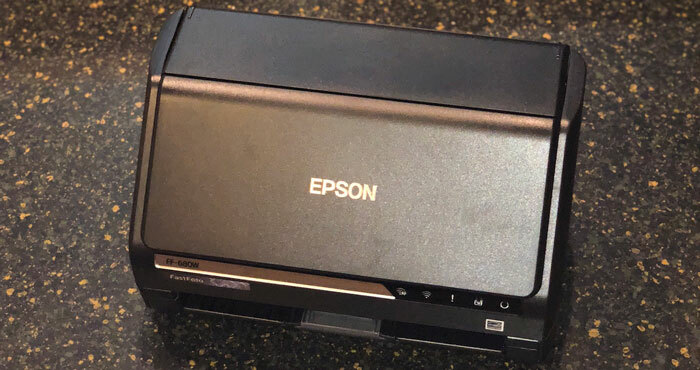 Out-of-the-box, the Epson FastFoto FF-680W is a compact rectangular box, measuring a mere 11.8 x 8.7 x 8.1 inches and weighing just 8.8 pounds. It's designed so you can easily tote it to where your photos are instead of schlepping your photos to it, further encouraging you to use it. Once positioned where you want it, the FastFoto unfolds like a flower, its automatic document feeder top folding up, and its retrieval tray pulling out below. The FastFoto FF-680W is a substantial upgrade of the previous FF-640W. On the hardware side, the 680W adds Wi-Fi connectivity, the ability to scan more photos in one load, scanning of a wider variety of photos such as Polaroids and panoramic and scans at higher resolution and in TIFF format. The 680W also now auto orients photos and has OCR capabilities for scanning documents for use in word processing programs. You connect FastFoto to your laptop or PC via an included USB cable or via Wi-Fi. I did have some trouble getting the FastFoto to pair with a dual-band mesh Wi-Fi system, so I connected via my cable modem router's 2.4GHz Wi-Fi network instead. While I managed to find and download the FastFoto PC software and pair my laptop to the scanner via Wi-Fi, the process was not nearly as simple or clear as it ought to be. The software isn't on the web page indicated in the included (and confusingly multi-language) one-sheet start guide, and it turns out there are two are separate pieces of software, Epson FastFoto and Epson ScanSmart. FastFoto is used for scanning photos and ScanSmart is used for scanning documents. I only discovered there was a separate downloaded version of ScanSmart when I couldn't find any document scanning settings in the FastFoto software. During setup, you'll have to update the scanner's firmware and software, restart your computer and figure out which button is the "Start" button, which is not clearly labeled (it’s the angled "E"-like key toward the bottom). The whole process seemed just a bit convoluted, but I got through it. I suggest accessing and reviewing the online FastFoto manual before getting started. This is advice I wish Epson would have offered since the manual provides a plethora of useful information and guidance on FastFoto's myriad set-up, capability and maintenance options. FastFoto's Wi-Fi is one of the major upgrades over the previous FF-640W scanner. A Wi-Fi connection means the FastFoto need not be adjacent to your PC, further increasing the flexibility of your scanning location. But, I found FastFoto's Wi-Fi connection to be a bit finicky and scanning slowed considerably. Those 36 photos took six-and-a-half minutes just to scan (before processing) via Wi-Fi versus just under a minute. When I reported this issue to Epson, the company asked if I had "many other devices sharing the same Wi-Fi network or running through a hotspot instead of a router." Yes and no. My apartment is flooded with Wi-Fi from a variety of mesh network routers and smart home devices, so my poor Wi-Fi experience is likely not typical. My advice: try the Wi-Fi connection first with a half dozen photos. If the FastFoto doesn't scan as fast (or nearly as fast) as in the video, you can just plug in the USB cable, which auto-disables the Wi-Fi link. Either way, though, is faster than one-by-one scanning on a flatbed scanner. Whether you want to keep both the original and the enhanced version. Once you have checked your settings, press the scan button (either on the FastFoto scanner or in the software). You then get a screen with a field for the year in which the photos to be scanned were taken, a pulldown menu indicating which season or month, and a blank field to fill in a label for the group of photos such as "Vacation" or "Wedding." Each photo file name will bear this label; the software automatically assigns and adds file numbers to this label. Then hit "Scan," sit back and enjoy the action. As noted, scanning, enhancing, processing and storing 36 photos takes just around a minute. Forgive me, but I'm still stunned by this speed, and I'm usually a cynical cuss when it comes to tech. Scanning the same 36 pics at 600dpi takes three times longer – three minutes and change – while a 1200dpi scan takes nearly 10 minutes. All of these results are faster than scanning each one-by-one on a flatbed scanner. Once the batch is done, you can either load in another 36 while maintaining the same settings and storage folder, or end the scanning and start the processing. As far as resolution is concerned, a 5 x 7 photo scanned at 300dpi creates a 2053 x 1180 pixel file, while at 600dpi you get a 4124 x 2360 image, and a 1200dpi scan results in an 8276 x 4710-pixel result. By comparison, an iPhone X creates a 4032 × 3024 image, so 600dpi is probably the best all-around option. Each scanned photo loads into the FastFoto software window. 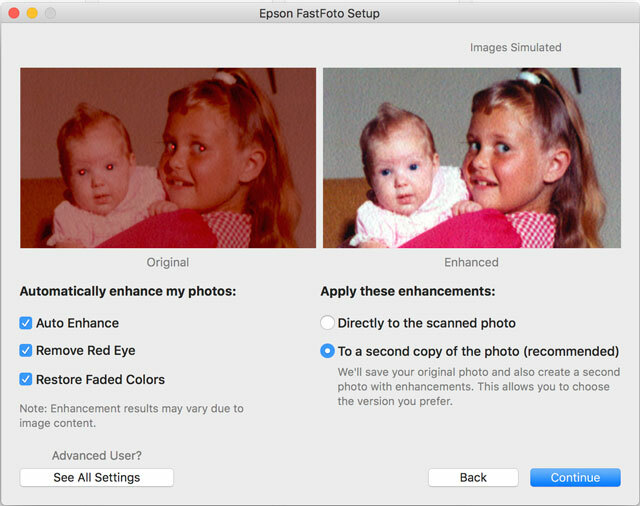 Epson's enhancement function visibly brightens, color corrects and adds contrast to each photo, which you can see in the original/enhanced comparison samples, which saves a ton of photo enhancement work and time later. The software adds the letter "a" to the file name of the enhanced scan, and a "b" for a scan of the rear of a photo, so you know which file is which. Within the FastFoto software window, you also can correct individual photo orientation – the software usually detects the difference between a landscape (wide) and portrait (tall) and orients each appropriately. But the software occasionally misses a few (and sometimes you load a photo upside down), but you can rotate wrongly oriented photos left or right, as well as correct for red-eye. 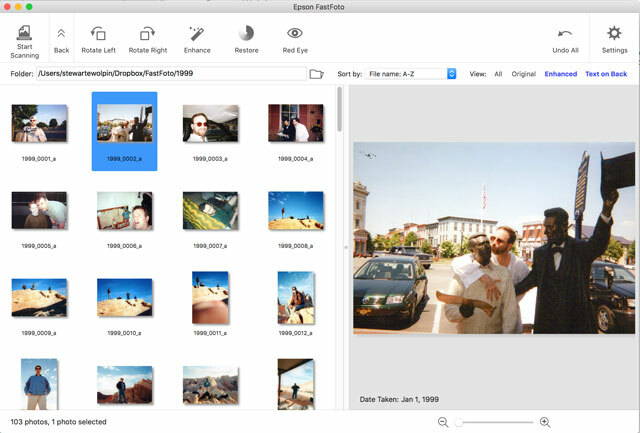 All-in-all, FastFoto performs everything quickly and proficiently to digitize your stash of aging snapshots. Organizing your physical photos before you scan will undoubtedly take longer than the actual scanning process. But even with this pre-scan sorting, you'd likely be able to scan your entire photo collection, hundreds of photos, in an hour or two. Once you scan your photos, you can fold up and store the scanner safely away, or lend it to family or friends. 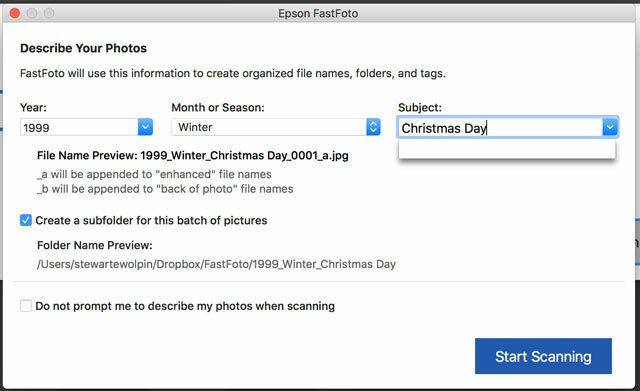 FastFoto scans more than just photos, it can also scan documents and optical character read (OCR) them if you want to edit them with Microsoft Word or another word processor. 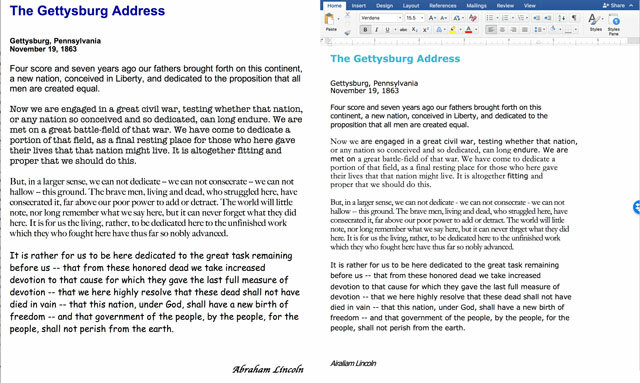 To test the feature, I scanned a copy of the Gettysburg Address that I created using a variety of fonts. FastFoto transformed the scan into a Microsoft Word document, even attempting to duplicate the varying typefaces I used. It had trouble only reading Lincoln's name in the fancy Apple Chancery font. So if you regularly need printed matter turned into editable text, the FastFoto performs admirably. Yes, FastFoto is pricey, especially considering you likely won't need it much after you've scanned all your old photos. But the time you'll save scanning your photos individually on a flatbed scanner and the satisfaction you'll get once you've safely scanned, enhanced and stored all your old photos, can hardly be valued. I wish the set-up was smoother and the separate software situation was made clearer, but these are minor quibbles. Considering how long I've yearned to add all my pre-2000 print photos to my digital photo collection and dreaded doing so on a flatbed scanner, it's hard to describe just how grateful I am to Epson for the FastFoto FF-680W ($599.99 on Epson, check price on Amazon).